Last week, Republicans unveiled a framework for their plan to cut taxes. And despite repeatedly claiming they would provide a “middle-class tax cut,” it was clear from the meager details provided that this plan offered nothing of the sort. Instead, as we long suspected would be the case, an analysis by the Tax Policy Center (TPC) confirms that the Republican tax plan amounts to nothing but an enormous tax cut for rich people—just like every single Republican plan before it. 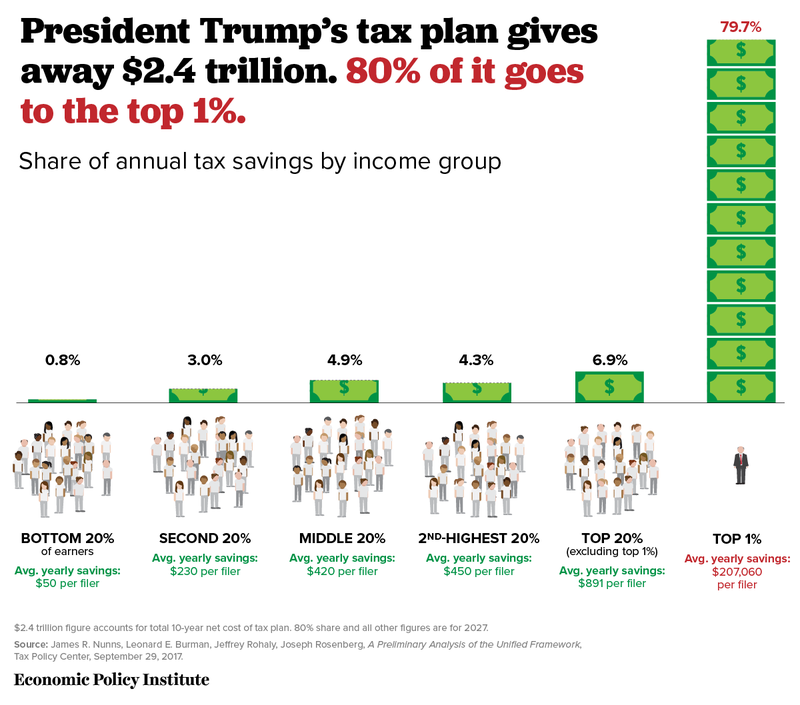 TPC found that by 2027, the Republican tax cut would deliver 80 percent of its benefits to the top 1 percent, households that currently have incomes of roughly $730,000 or more. The top 1 percent of tax filers would receive a $207,060 average tax cut. In comparison, the bottom 20 percent of earners will receive only a $50 average tax cut. And hidden behind the crumbs thrown toward the middle-class is significant variation. If you’re middle-class, maybe you’ll get a small tax cut—the middle 20 percent of tax filers will receive a $420 average tax cut. Or maybe you’re part of the 30 percent of taxpayers making between about $50,000 and $150,000 that TPC found would see your taxes increase. Any claim that Republicans were ever genuinely planning a “middle-class tax cut” should be thoroughly dismissed. Far from it, Republicans appear dead-set on cutting taxes for the ultra-rich.